With breathtaking views over the Grandes Rousses mountain peaks, Les Edelweiss residence is made of 5 impressive chalets, each housing only 10 extensive chalet apartments with extensive south-facing private terraces. Situated in Vaujany centre, it offers exceptional views on the Fare Cascade, metres from the telecabin lifts and close to the shops and restaurants. Concierge service also optional and high-end fixtures. It is part of famous Grand Domaine Alpe d’Huez and will be linked to Les Deux Alpes in 2021 to create one of the best ski areas in the world. With breathtaking views over the Grandes Rousses mountain peaks, Les Edelweiss residence is made of 5 impressive chalets, each housing only 10 extensive chalet apartments with extensive south-facing private terraces. Situated in Vaujany centre, it offers exceptional views on the Fare Cascade, metres from the gondola lifts and close to the shops and restaurants. Concierge service also optional and high-end fixtures. It is part of famous Grand Domaine Alpe d’Huez and will be linked to Les Deux Alpes in 2021 to create one of the best ski areas in the world. Each apartment is sold with its own private parking, heated ski locker, a cave for personal storage. There will also be a Spa with sauna, jacuzzi and gym for the owners to unwind after a long day on the pistes. 1) When you purchase an apartment, you benefit from a fully-managed rental in place to generate tax-free rental income (contact for more details). Also on a few units, you do not have to advance the VAT and claim it back, you just pay the price excluding VAT. “The Edelweiss in Vaujany offers flexible rental management options and good inclusive solutions like a furniture pack, fully-equipped kitchen and bathroom but also a ski locker as well as a cave for storage that you can keep for yourself if you do rental. 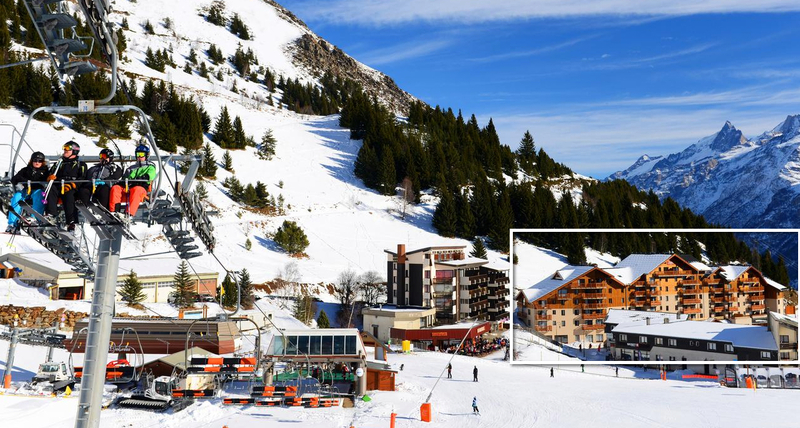 Also the Grand Domaine ski area will link with Les 2 Alpes in 2020 so a good time to buy now. While construction permits, we can combine several apartments as one trophy 3/5 Bed apartment. Contact us for more info. Apartments sold with fully-equipped kitchen and bathrooms, ski locker, cave for storage and indoor/outdoor private parking. Furniture pack option. Vaujany is a traditional mountain village with its wood and stone chalets, its small streets, fountains, farms and church. Located in Isère and facing the majestic Grandes Rousses mountain range, Vaujany has kept its identity and mountain traditions yet the different infrastructures linked to the winter and summer activities are very modern. Soon Alpe d’Huez will link up with 2 Alpes ski area to create one of the best ski areas in the world and Vaujany will be right at that connection. You will enjoy the almost endless amount of activities whether in winter or summer all set in this grandiose scenery. It also offers 250kms of Alpine skiing (high altitude up to 3,300m) as well as many tracks for hiking, cross country skiing as well as snowshoeing and more. Summer activities are many not to mention the famous Tour de France in Alp d’Huez. The Vaujany Ski area is an integral part of a massive domain covering 8 villages: Alpe d’Huez, Auris, Clavans, Le Freney d’Oisans, La Garde, Oz en Oisans, Villard Reculas and Vaujany.